Practo Technologies Pvt Ltd, a web-based clinic management software developer which derives a major portion of its business from primary clinics, has raised $30 million (Rs 187 crore) in its second institutional round of funding led by Sequoia Capital with participation of Matrix Partners as a new investor. This makes it one of the largest Series B round of funding in an Indian tech startup. Average Series B round of funding in India has grown over the years but still figure in the $10 million range (click here to read more on the trend). Practo will use the funds for expansion in India and abroad. It also plans to make a few strategic acquisitions and expand its team. "Over the next 12 months we will expand to 35 cities in India and several more international locations," said Shashank ND, co-founder and CEO of Practo. The company plans to expand to six countries internationally. Practo offers services like helping patients find relevant doctors online, compare them and schedule appointments. It also sells PractoRay under software-as-a-service (SaaS) model for primary clinics, which enables doctors to schedule, manage patient records, billing etc. 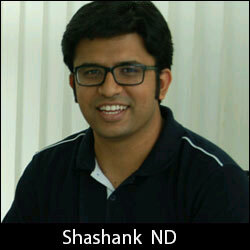 It was started in 2008 by two graduates from National Institute of Technology Surathkal -- Shashank and Abhinav Lal. It was part of The Morpheus accelerator and also got seed funding from Sequoia in 2011. Prior to that it had got some angel funding too. It had last raised around $4.6 million from Sequoia Capital in 2012 in its Series A round. At that time Sequoia had bought some stake held by The Morpheus. According to the company, every month, over 1 million users book 120,000 appointments via Practo Search. Practo Search volume has grown more than 10x in the last one year, it said. “From our first seed investment in Practo in 2011, the company has come a very long way. It has now scaled to being the market leader in online healthcare in India, a category that has created multiple multi-billion dollar companies around the world," added Shailendra Singh, managing director at Sequoia Capital. “Practo is revolutionising healthcare by enabling consumers to find the best doctors, book instant appointments and make better, more informed health decisions. It is our privilege to work with Shashank ND and Abhinav Lal, to scale and bring Practo to millions of consumers around the globe," said Avnish Bajaj, co-founder and managing director, Matrix India.